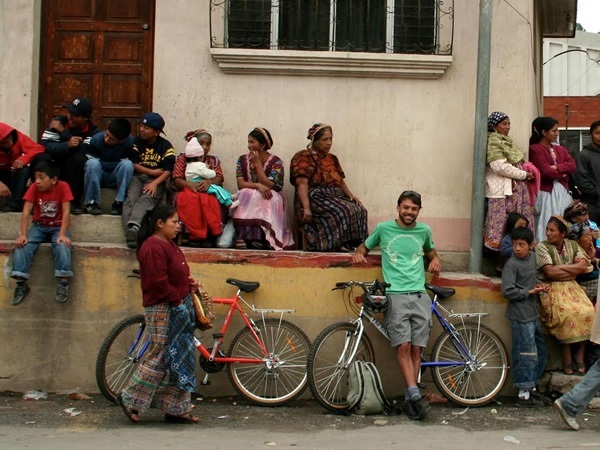 Watching a parade as a solo traveler in Guatemala. “What’s up with the book?” Javier the taxi driver asked me. I looked at the three girls in the backseat. They weren’t technically gringas (Americans) — they were Canadians — but in many parts of Latin America all tourists are gringos. All three held up their Lonely Planet guidebooks, straining to read in the falling darkness of early evening. I laughed and explained to Javier what a guidebook was. In fairness to the girls, they were just passing the time on a long taxi ride. But we’ve all met a certain kind of backpacker, the long-term traveler who does nothing without consulting the book, whether Lonely Planet, Rough Guides, or something else. These guidebooks are certainly useful, but there’s a lot more to Latin America than what someone else has already done and written about. Fortunately, having a great trip and a rich cultural experience while still saving money is what traveling in Latin America is all about. 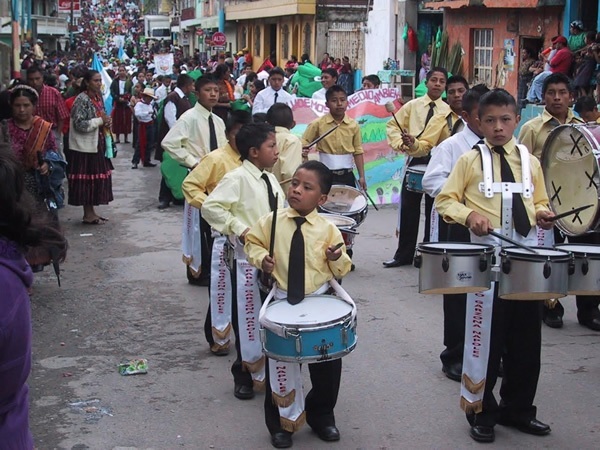 A parade in Almolongo, Guatemala. Greet people everywhere you go. Say buenos días (good morning) or buenas tardes (good afternoon) before you start any communication. Say provecho (have a nice meal) to other diners in a restaurant, both when you enter and when you leave. Wave and smile to people on the street. Strike up conversations with anyone who appears friendly. Even when you’re in a place where many people speak English, it’s good to learn at least a few phrases in the local language. Begin with ¿Habla usted inglés? (Do you speak English?) and No hablo español (I don’t speak Spanish). It shows respect. 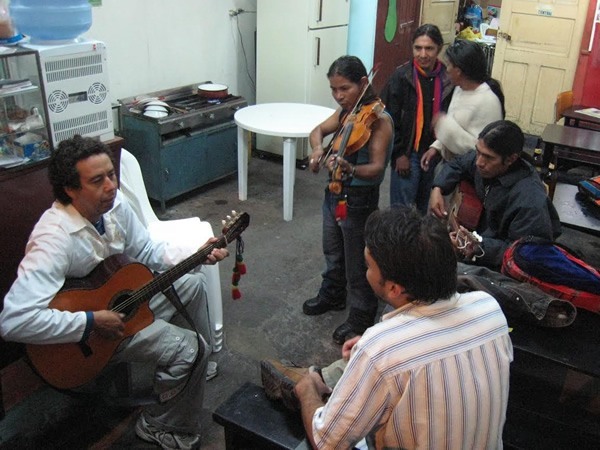 Jamming with Locals in Baños, Ecuador. If you are unsure of where you are going, don’t hesitate to ask for directions, but do it twice or more. I believe that asking for directions is one of the great pleasures of traveling in Latin America – people love to give them and often in enthusiastic, elaborate fashion. However, they are frequently wrong. Pack the smallest backpack possible. You want it to fit below your feet and under the bus seat. If not, it will be out of sight above or below the bus, exposed to rain and/or robbery. Don’t bring lots of clothes — buy them on the road. T-shirts are cheap everywhere. And fold your dirty laundry in your backpack to save space. In certain fancy neighborhoods in big cities (Condesa in Mexico City, Ipanema in Rio de Janiero), a dorm bed in a hostel may be your cheapest option, but in my experience a single room in a small hotel in the city center is always cheaper. Stay in a hostel if you want to meet people (locals or other travelers, depending on the hostel); stay in a small hotel if you want privacy and to save money. In many cities in Latin America small, often family-run hotels will be clustered around the parque central (center square), aka zócalo (used in Mexico). Give yourself some time to walk around and compare. Prices are often posted behind the front desk, and if you want to save money, ask for a discount — especially if you will stay more than a week. Always ask to see the hotel room before you take it. Peek into the bathroom. Try the shower to check water pressure and temperature. Check the mattress for bedbugs. Ask about them and other bugs. They will always say that there aren’t any, but if you see one and want to leave, you’ll have a better chance of getting your money back. One more thing — don’t stay in a hotel above a restaurant. Cockroaches and strong odors abound. Each Latin American country has several bus companies, and sometimes there is more than one bus station in the same town. There may be no difference between first- and second-class buses other than price, or there may be a huge difference. Give yourself some time to shop around and ask advice before buying tickets. For a cheap breakfast, buy bread in the panadería (bakery) and fruit in the frutería (fruit shop) or market. In markets, expect to be given a higher price than the locals, and rather than haggle over a few dollars or dimes, simply go to a few different people within sight of each other. If they see you shopping around you are more likely to be quoted a fair amount. 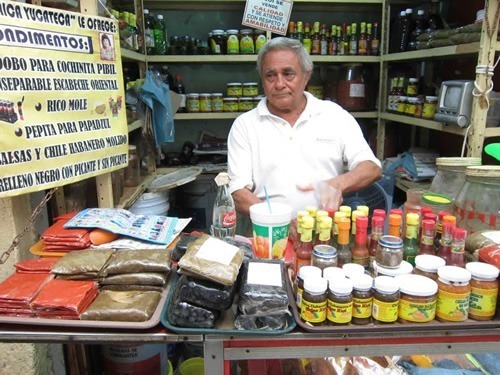 Vendor selling mostly very spicy condiments at a market in Mexico. Some of the best lunches are found in markets. The food is cheap and regional. On the Mexican coast you get shrimp soup. In Puebla you get a massive plate of mole, a secret sauce of many ingredients, including peppers and chocolate. In Guatemala you get fried chicken. 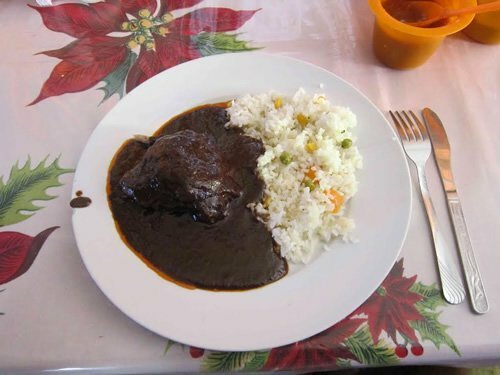 A mole dish served for lunch at a market in Mexico. Choose the busiest restaurant in the market. Don’t eat in empty places. Yes, you will feel sorry for the smiling people beckoning from empty food stalls as you pass in favor of more popular ones, but that’s the way it has to be. Give beggars a clear no, a headshake, and a smile, and they will leave you alone. In Spanish, a simple gracias is how you say no thanks. Sometimes they will approach your table at a restaurant. Don’t ignore them or try to apologize or they will keep bugging you. Many people argue that giving beggars change just hurts them, that it is better to make a donation to a local school or charity. But if you have change in your pocket and want to give it to someone who you think really needs it, then do so. But don’t do it because you feel scared or guilty, or the person will notice and may manipulate you into giving more. Go to music clubs with live bands. Even if you can’t dance, you’ll have a good time in any place that plays salsa or cumbia (dance music that at first listen sounds similar to salsa, but actually has a simpler, deeper groove). Don’t consult your guidebook to find them, but ask the hotel reception or a friendly bartender or waiter. You will meet locals and see some great music. If you use your guidebook to find places to go out, you will be surrounded by other travelers — not necessarily a bad thing, but you might have a better time in a club frequented by friendly locals. If you like the music but can’t dance, then learn the basic steps — they will take you a long way. You should find lots of locals in the club who are willing to help out a gringo, or you can seek out a lesson. And, last but not least, the rule of thumb for all: Don’t wait to do anything you want to do. Don’t say next time, or tomorrow. Don’t skip something that sounds interesting because you want to move onto another place. Just do what you want, when you want to do it. The unknown things in the future can wait. Sometimes when I’m in a renowned part of Latin America, such as Lake Atitlán in Guatemala, I meet people on their round-the-world trip. They stay two days; I stay two months. They see the highlights of countries all over the world, often look stressed out, and perhaps never backpack or revisit the site again. I relax, learn Spanish, make friends, find the best clubs and restaurants, and save so much money that I can do it again next year in another part of the world. Memorize some Spanish phrases, close the guidebook, and ask advice from locals and other travelers you meet. I never make a plan when I travel, but ask people for suggestions and information and try to follow whatever sounds good. 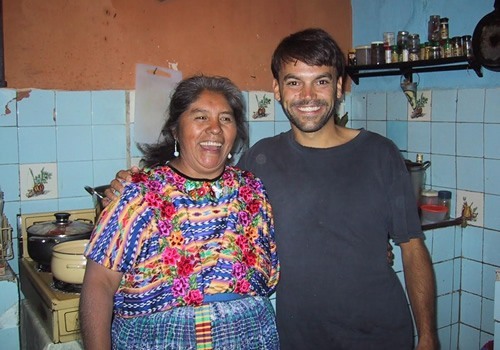 The author and Spanish teacher Alejandra in Quetzaltenango, Guatemala. While the round-the-world trip certainly has its place, I wonder if many people travel this way because they think it’s their only chance to see the world. And when you try to squeeze in more, somehow you end up seeing less. Traveling slowly is often the best way to experience cultural immersion, which may ultimately be a more intelligent and memorable use of precious time.